Time to choose a first anniversary gift! Congratulations! A year ago, you and your partner took the great decision to get married and unite your lives. Throughout this year you have probably shared many wonderful moments, as well as challenges. Paper symbolizes the fragility of the first year of your marriage. This is why the first anniversary gifts are traditionally made of paper. Getting to know each other can be hard, but you managed not to let anything tear you apart. Now, to celebrate, it is time to choose the first anniversary gifts! Surely, your partner might be expecting to get a pretty postcard, but you are not the kind of person that settles for ordinary first anniversary gifts. Imagine their expression when they realize that you have officially registered your anniversary in the International Day Registry Database! All you need to to is go to MyDayRegistry. There, you will register the day of your choice. After two days you will receive an official framed certificate to give to your husband or wife. Along with it, you will get an online memory book that you can fill with your photos, videos and favorite songs! What’s not to love? A year ago you went into the great adventure of planning and realizing your wedding. Now that is done and so is your first year as a married couple. Why not celebrate the end of this cycle and the beginning of a new one with a special book? One of the most original first anniversary gifts, the book that you can get from LoveBookOnline is both fun and creative. Using cartoon characters and your own text, you can create the story of your lives and remind your spouse of all the wonderful moments you had together. Then lovebookonline.com will send you a great quality hard copy of your book in hard or soft cover. Flowers are beautiful and most people love them. But they have a small life span and in a week’s time they will need to be thrown away. Still, you can offer your spouse this romantic gift, with a touch of immortality. “Justpaperroses” create wonderful flowers out of paper. These first anniversary gifts can even be personalized with quotes, names or pictures. Imagine a bunch of wonderful paper roses with a picture of your wedding day printed on them or the date of your anniversary. It will be a great decoration for the anniversary dinner as well! If you are not good with words, here are some good news for you! You can skip the card and let a picture talk about your feelings. Over at MyDavinci you can find first anniversary gifts that will talk directly to the heart of art lovers. Just send them a picture of your spouse or a picture of the couple celebrating and they can make a painting drawn with pencil, ink, watercolors or oil paints. Contrary to other first anniversary gifts, this one can accompany you and your loved ones for many many years. An apple a day might offer you physical health, but smiles are important to keep you and your love emotionally healthy. And there are first anniversary gifts that can fill your life with smiles not just on the date of your anniversary! 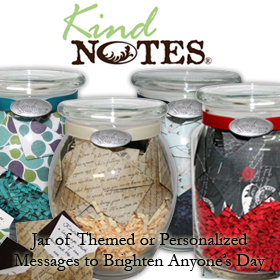 Kind Notes, from KindNotes, are beautiful jars filled with 31 meaningful notes. This way, your loved one can open one each day of the month and start their day with a smile. Each quote has its one linen card stock envelope with a charming pattern. There are already assembled jars that would make excellent first anniversary gifts, with themes including family, love and gratitude. You can also ask the nice people over at Kind Notes to hand-write the cards for you or send you a set with blank cards, to write them on your own! When one photo isn’t enough, you need to give an anniversary gift that tells the love story of the couple with multiple pictures. Mixbook lets you create custom personalized books with as many photos as you want. You can be the designer and resize them and add text to create your own special photo book that reminds them of their journey together to this day. If you want to give a gift that is sure to be a hit and something no one else thought of, pick out a puzzle from CafePress. You can create a custom puzzle from a photo or wedding invitation or other memorabilia that will have special meaning. These puzzles come in full color and will add an element of fun into the occasion. It also makes a creative twist on the traditional first anniversary gift of paper. A calendar is a timeless gift and you can make it personal with a photo calendar from minted. These calendars use premium textured paper that is larger than standard photo calendars. Select a special picture from the wedding day and this will make a wonderful first anniversary gift that they will use the entire year. You can choose between two sizes to create the exact gift you want. If you want to bring memories alive for a special couple on their anniversary, Canvas Pop has the perfect gift. A photo mosaic is a delightful twist on the traditional first anniversary gift, and it shows the thought and love you put into selecting just the right thing. You can choose from dozens of photos that have special memories and add them all into this mosaic. This is a gift they will spend hours looking at. If you are looking for a special way to demonstrate your love in a first anniversary gift, a message in a bottle might be the answer. This classic idea from Timeless Message takes on new meaning with a variety of designs. You can create your own message or select from a number of pre-printed messages to tell your feelings. This is the perfect way to say how you feel after your first year together. No matter what you choose, keep in mind that first anniversary gifts are gifts that need to resonate with your loved one and be meaningful for both of you. What matters most is the thought, but an original gift will make the day more exceptional. It will show your loved one that you care enough to take the time and choose something special for this unique day, so it is worth the effort!